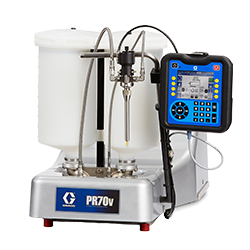 Exclusively dedicated to the manipulation of the fluids two-components, PR70 PR70 allows a secure distribution of solutions, the properties of which require that they remain separate until the application. You can handle from now on these fluids with a level of optimal control. 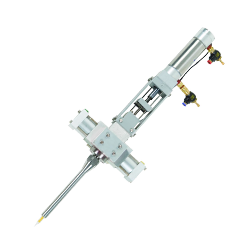 A specialized valve incorporates both components separately, then connect them in the container syringe situated in the bottom of the valve. The process guaranteed you a uniform and homogeneous result. 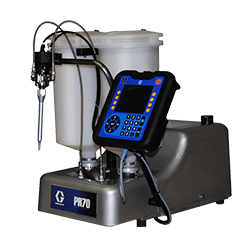 Cousin of the PR70, the PR70V is dedicated to the dispensing of materials two-components with ratio variables. 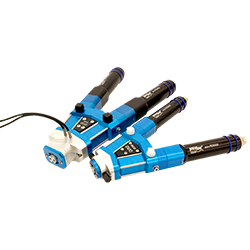 A complete and multi-purpose range designed for the professionals of the dispensing. It can be noticed that the series PR favors the treatment of important quantities. There is no equivalent on the market. 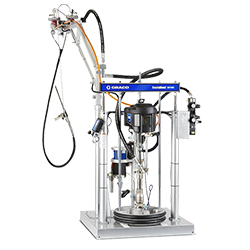 The system with fixed report PR70 dispenses, mixes and distributes exactly two components products, from low to average viscosity,for flow, joint, sealing, coating and filling of syringe. All the characteristics you need in a compact and modular design. 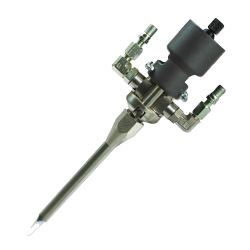 The dosing valve PD44 is specifically designed to dispense small amounts of water thin to paste viscosity materials from 0.005cc’s to 5cc’s. ExactaBlend ™ provides a well-proportioned distribution of two-component sealants and glues for glass facades, insulating glazing and other applications. 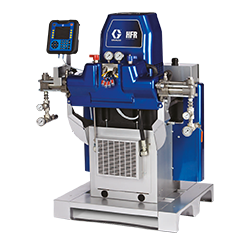 The metering system HFR can process many products, from rigid polyurethanes to elastomers to epoxy resins. 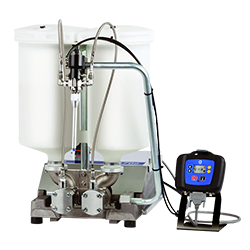 The volumetric valve Eco-DUO is a volumetric dosing system for precise mixing and the application of minimum quantities of bi-component fluids. 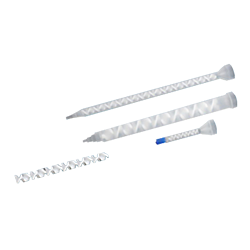 The two-component mixers have the elongated shape of a syringe but are finer. They are screwed to the end of the two-component cartridges.